Three million journeys were undertaken in last nine months, Dublin City Council said today. DublinBikes reached 50,000 yearly subscribers on its 5th birthday last September and this has now increased by 3,484 subscribers. Each of the near 53,500 subscribers pay is now €20 per year and usage charges if they hire a bicycle for longer than a half hour at a time. Those users have take 981,746 trips in less than the first four months of this year. The system’s expansion, which was completed last year, more than doubled the number of stations to 101 and increased the number of bicycles to 1,500. The network of bike stations, however, remains confined to a relatively small area of about 7km squared. DublinBikes stations are limited to areas inside Dublin’s canals, where bicycle traffic jumped 22.5% in the last year — which is viewed to be closely linked to the expansion, but also continues an ongoing increase in cycling in the city. The busiest day ever to-date for DublinBikes remains October 2, 2014, when 15,441 journeys were taken. DublinBikes is sponsored by Coca-Cola, as is the case with all of the public bicycle systems on the island of Ireland — including the schemes which opened in Cork, Limerick and Galway last year, and a system in Belfast, which had a soft launch yesterday. The 10 millionth DublinBikes journey was made this week by Mairéad Roche (pictured above) who hired a bicycle at the docking station at Inchicore station near Kilmainham Gaol. Coca-Cola Ireland presented her with a gift of a cycling holiday to France. DublinBikes is run by JCDecaux on behalf of the city. 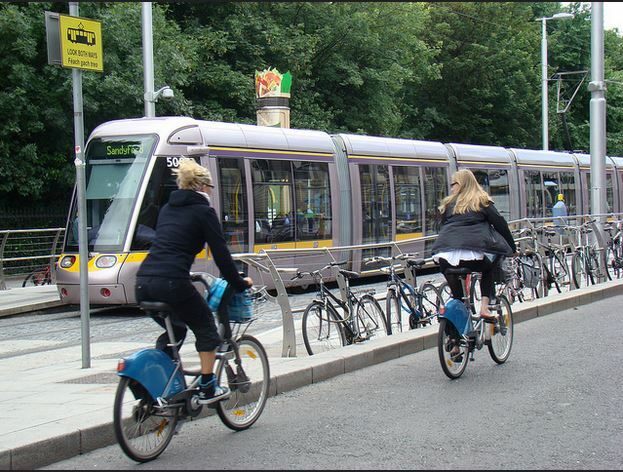 The original system was funded by swapping the 15-year rights to on-street advertising spaces in return for the bicycles and a wayfinding system of signs mainly aimed at tourists and visitors to central Dublin. The expansion was funded by a mix of subscription fees, usage fees, grant funding from the National Transport Authority, and sponsorship from Coca-Cola. Dublin City Council puts the trend in an increase in the numbers of people cycling in Dublin down to a number of factors including: DublinBikes; the opening of Dublin Port Tunnel in 2007 which was introduced with city centre truck restrictions which removed large volumes of trucks from city streets; and the expansion of cycling facilities such as the Grand Canal cycle route. In statement today, the council highlighted how it has just finished its first round of public consultation on a new off-road cycleway along the Liffey Quays, called the Liffey Cycle Route. It said that the council’s opinion is that such routes “give commuters greater choice in deciding how they want to travel around Dublin”. 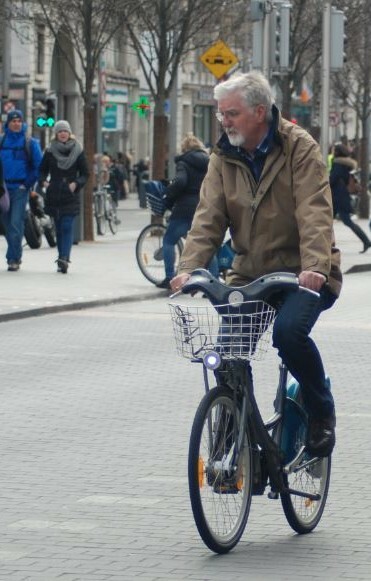 I’d be interested to see a review of the opinions on the Dublin Bike scheme in the media from the planning phase. I think everyone more or less agrees it has been a huge success now but I seem to remember the conventional wisdom being that it would be a huge waste of time and money. Everyone who was willing to cycle already had a bike. The bikes would all end up in the canals. The council was giving away valuable advertising revenue and further blocking up the already congested roads with stands and signs for no benefit. Did Brown Thomas and their secretive cabal of city centre businesses send missives detailing how the scheme would destroy them and drive away customers like they did with the quays bike lane? How much are coke paying? Starting the end of June 2014, a three-year sponsorship deal, worth “almost €2m”, will see the scheme rebranded as Coca-Cola Zero dublinbikes. Love Dublinbikes and indeed using them convinced me to buy my own bicycle initiating a rather unexpected love affair with cycling. I hope the scheme continues to grow and improve. The redistribution of stock is currently letting the system down I think and have seen much frustration expressed on social media about this issue. In addition it would be nice to be able to report faulty bikes at the docking stations. Several times I have taken a bike which was in need of maintenance but was unable to either prevent the next person taking the particular bike or expedite the repair process by reporting the fault. Worryingly I saw somebody cycle a bike at night with a faulty rear light which I suppose will happen from time to time but with no fault reporting process how can we prevent other users using the bike even if we do notice it? Still though a great success and I wish it more success and continual improvement in the future.